Shinx in game: 2,965 Who? Important notice! Pokemon Shinx is a fictional character of humans. 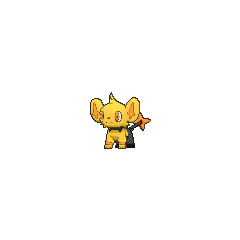 Shinx (Japanese: ???? Kolink) is an Electric-type Pokémon introduced in Generation IV. It evolves into Luxio starting at level 15, which evolves into Luxray starting at level 30. 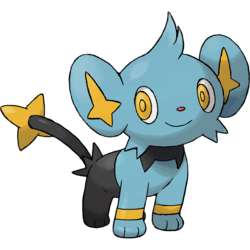 Shinx is a quadruped, feline Pokémon resembling a lion cub or lynx kitten. Its front half is light blue, while the rear is black. There is a short tuft of fur on its head and smaller tufts on each cheek. The top tuft is smaller on the female Shinx. It has large, oval ears with yellow, star-shaped markings on the insides, yellow eyes, and a tiny, red nose. Whenever its mouth is open, small fangs can be seen in its upper jaw. A black marking encircles its neck like a collar and there are yellow bands above its forepaws. The hind paws are black on the male Shinx and blue on the female. Spiked fur surrounds the base of its long tail, which is tipped with a yellow star shape. If it senses danger, its fur can gleam brightly to blind predators so it can flee. Electricity is produced by the extension and contraction of muscles in this Pokémon’s forelegs. In A Campus Reunion!, it was revealed that Clemont had befriended a Shinx in his youth. He evolved into a Luxio sometime after he lost contact with him and captured him when he met up with him again. A Shinx appears in Pokémon Mystery Dungeon: Explorers of Time & Darkness asking Team Poképals to retrieve a Gabite scale to help his sick sister. His sister also makes an appearance at the end of the episode. A Shinx appaered as a mask for the festival in Capacia Island UFO!. 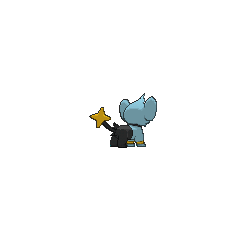 A Shinx appeared in The Journalist from Another Region!. A Shinx appeared in a fantasy in Clemont's Got a Secret!. DP010 Shinx Ash's Pokédex Shinx, the Flash Pokémon. When it senses danger, the hairs on its body light up and it runs away, leaving its opponent dazed. BW111 Shinx Ash's Pokédex Shinx, the Flash Pokémon. 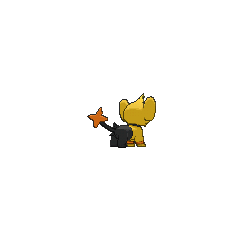 When Shinx flexes its muscles, it generates electricity. When sensing danger, its fur glistens. Shinx in Diamond and Pearl Adventure! Platinum was attacked by a pack of Shinx and Luxio. Shinx was the first Pokémon Hareta caught with a Poké Ball. Hareta caught it with the intention of challenging Jun to a battle, but the expected battle was sidetracked by Team Galactic's attack on the Valley Windworks. It evolved after defeating B-2 on Iron Island. Its forelegs have a muscle-based system of generating electricity. Its body shines if endangered. The extension and contraction of its muscles generates electricity. Its fur glows when it's in trouble. Moves marked with a superscript game abbreviation can only be bred onto Shinx in that game. Shinx plays in the Meadow Zone. His favorite Attraction is Bulbasaur's Daring Dash. 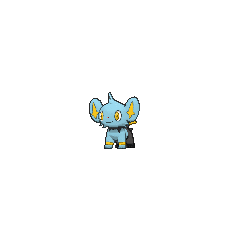 For other sprites and images, please see Shinx images on the Bulbagarden Archives. Shinx bears a resemblance to a hoax Pokémon that was made up on April Fool's Day 2005. 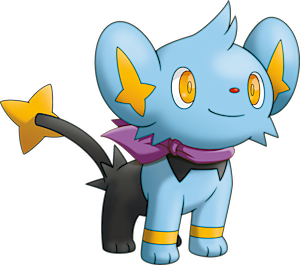 Shinx's English name was originally thought to be "Spinx" because of a low quality photo with its name on it. 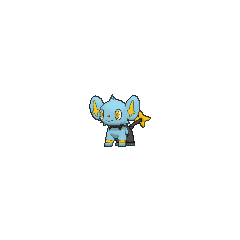 Shinx is the only Pokémon with a base stat total of 263. Shinx and its evolution Luxio evolve at the same levels as Mareep and Flaaffy. Shinx is based on a lynx kitten or lion cub. Shinx may be any combination of shock, shine, or shining and lynx or sphinx. Kolink may be a combination of ?ko (child) and blink or ???? lynx. Mandarin Chinese ??? / ??? Xiaomaoguài Literally "Small cat freak"